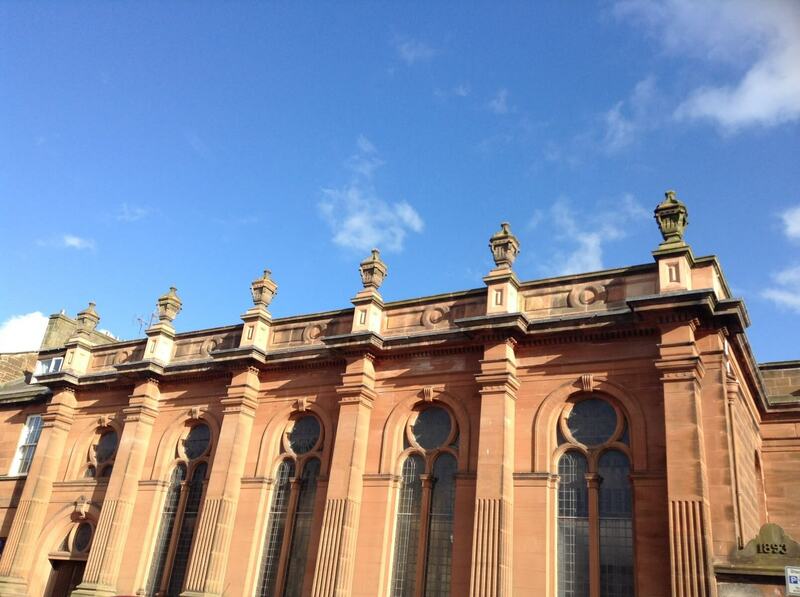 St George’s opened in 1843 and has been a place of Christian worship in Dumfries for 175 years. St George’s continues to place itself at the heart of the Dumfries town centre community and seeks to build on that foundation for future generations. Only ten ministers have led the congregation through the generations and in that time individual members and groups from the church have contributed greatly to the life of the Dumfries community. Read more about the history of St George’s below. St. George’s Church was born out of the Disruption of 1843, a period in church history when 474 ministers (out of a total of 1,203) from the established Church of Scotland seceded to form the Free Church of Scotland. It came at the end of a bitter conflict within the established Church, known as the Ten Years Conflict. In leaving the Church, ministers forfeited their livings and manses, with an uncertain future ahead of them. The Reverend Thomas Chalmers became the first Moderator of the Free Church. One of the first acts of the founders was the signing of the Act of Separation and Deed of Demission on May 23rd 1843. The 37th signatory was the Reverend John Robertson Mackenzie of St. Mary’s, Dumfries who had been ordained in 1841. When he seceded from St. Mary’s, he was followed by the majority of his Kirk Session, plus many of his congregation and sympathisers from St. Michael’s and Greyfriars. Immediately after the Disruption, there was a need for money to build churches, manses and schools, pay the salaries of ministers, teachers and missionaries and support the poor. It was Mr. Mackenzie and his followers who worked tirelessly to raise money and support for the building of a Free Church in Dumfries. The Church’s work also depended on the generosity and goodwill of independent benefactors. Mrs. Susan Henderson (nee Milligan), purchased a piece of land in George Street for £185 and the foundation stone of the Free Church was laid on Saturday August 26th 1843, on the same site as our present church. An original poster advertising the laying of the foundation stone was presented to our church in 1960 by the family of the late Mr. and Mrs. James Robertson and is on display for all to see. The first Kirk Session met on August 21st 1843 and the first meeting of the Deacons’ Court took place on June 24th 1844. The new church building was opened on Sunday, April 14th 1844. Designed by William McGowan, architect, Irving Street, the church accommodated 1,160 people and cost £1,217 to build. It was described as ‘plain, elegant and commodious.’ No illustration of the original building can be traced, but working from an 1859 plan of the church, local architect Mr. Wolffe prepared sketches in 1993, of the church as it may have looked in 1844. The Kirk Session records of the time show a flurry of activity by the Free Church of Dumfries. By 1845, there were 14 elders and 12 deacons. Mission work was carried out, districts entrusted into the care of an elder and deacon, Sabbath Schools were set up, seat rents established and communion celebrated four times a year with members using communion tokens. Led by an enthusiastic minister and hard working office bearers, the church was regarded in Scotland as the centre of evangelism with a congregation eager to spread the Word to as many people as possible. It is a pity therefore that Mr. Mackenzie’s ministry was to end on a sour note. to an English Presbyterian Church in Birmingham and remaining there until 1873. Our second minister, the Reverend Dr. James Julius Wood, cut quite a figure as he went about his pastoral duties in Dumfries. He was described as ‘a worthy divine who wore black silk stockings and buckled shoes, knee breeches and a swallow-tailed coat, his hair as white as snow flowing over his shoulders.’ He was inducted to the Free Church on June 8th 1848 and shortly after, Dr. Wood found himself ministering to the townsfolk as cholera struck Dumfries, killing over three hundred people. Dr. Wood thoroughly identified himself with the Revival Movement of 1861 which was a time of great religious awakening. Our church witnessed remarkable scenes as immense crowds of people from all walks of life jostled with each other to find a space in church, all thirsting for the Word of God, all seeking their Lord and Saviour. How Dr. Wood must have rejoiced! In April 1870, a photograph was taken of Dr. Wood, aged 70 years, surrounded by his elders and deacons. Each person can be identified by name and in most cases, his occupation. This remarkable photograph hangs in St. George’s today and as solemn, whiskered faces stare out at you, it somehow brings the history of our church more to life. Dr. Wood died on March 23rd 1877 and is the only minister of our church to be buried in Dumfries. An inscription can be found on his memorial stone in St. Mary’s churchyard, taken from an address he delivered as the Moderator of the General Assembly of the Free Church in 1857. Born in Peebles on Christmas Day 1830, the Reverend James Freer was inducted as colleague and successor to Dr. Wood on May 13th he was known from an early age as ‘the child of many prayers’ and became a Sabbath School teacher at only 14 years of age, a remarkable achievement. Missing church records have made it difficult to obtain information about events during Mr. Freer’s ministry. He wrote a book called ‘The Grace of Charity and Other Sermons’ and was described as ‘a thoroughly able, well- equipped, devout and consistent minister, a kind hearted and true friend.’ Mr. Freer suffered much ill health during his life and resigned his charge in 1881. He died in Edinburgh in 1887, nursed by his devoted wife. 1875. The Reverend Charles McNeil was inducted to George Street Free Church on June 1st 1882. Mr. McNeil’s ministry began at a time when there was a great spiritual movement over the country, in connection with the American evangelist D. L. Moody, who preached in our church in August 1882. Banks and numerous other organisations. With so much going on, Free St. George’s needed a church hall and quickly! A suitable position for halls was purchased in Buccleuch Street on the site of the old prison and adjoining the Sheriff Court House. The building, designed by James Halliday, architect, in the style known as Scottish Domestic, opened on June 3rd 1889 at a cost of £3,709. A walk down Buccleuch Street today reveals the burning bush emblem and the words ‘nec tamen consumebatur’ still visible over the doorway of a building where the halls once stood. It certainly seemed to be a time of prosperity for the congregation as thoughts soon turned to the building of a new church. It was eventually decided to remodel the church in George Street, extending the building by including part of the manse and the complete alteration of the church interior. Plans were drawn up by James Halliday in Italian Renaissance style and work began in June 1892. Our church re-opened on December 10th 1893 at a cost of £4,157 inclusive of an organ which was installed five years later. The new church drew gasps of admiration and its interior decor and colours merited a detailed description in the Journal of Decorative Art, April 1894. Mention must be made of the formation of The Woman’s Guild in 1896, women working together, organising events, building up the Church, using their gifts to God’s glory….and still going strong today! A major event took place in 1900, when the majority of Free Church members joined with the United Presbyterian Church to form the United Free Church and henceforth our church became known as St. George’s United Free Church. The Reverend Duncan Ross was inducted on September 10th 1909 with a ‘fruit soiree’ held in the halls. He was to have a long and fruitful ministry spanning 32 years. During times of great difficulty and hardship, he acted as a source of strength leading the congregation through the Great War, ministering to the congregation in the post war years and guiding them through years of social and economic change until the outbreak of World War Two. Mr. Ross made it clear from the very start that he expected every member of St. George’s to be a worker for Christ. In 1910, the Deacons’ Court decided that a quarterly magazine should be published to keep members informed about the work of the congregation. The magazines give us descriptive accounts of missionary work at home and abroad and the new beginnings of organisations set up to encourage children and young adults in a spiritual and recreational way, a congregation working very much together under their new minister. Changes were also taking place with the congregation stepping out from the Victorian era into a more modern world. Mr. Ross was working in Interlaken when war broke out in 1914 as the United Free Church had 22 outposts in Europe at that time. He was given responsibility for 25 people, whose names were entered on the back of his passport, thus enabling him to conduct everyone back to England safely. April 1917 saw Mr. Ross laying down his duties in the congregation as the United Free Church made an appeal for ministers to work in church huts amongst the young men fighting in the war. He set out for Flanders to occupy a hut known as the Murray Memorial Hut and remained there for four months, ministering to soldiers. In 1921 a memorial tablet was dedicated to the men of our congregation who gave their lives and can be seen in the entrance hall of our church today. In 1920, a dwelling house at 14 Catherine Street was bequeathed to be used as a manse by the minister. Several improvements were made to the church including new rooms being added in 1924. These are now used as a downstairs office and an upstairs lounge which has recently been decorated by our young Lightseekers. In January 1941 Mr. Ross became ill and on medical advice, he decided to retire. It was a great blow for him as he had hoped to continue as minister in St. George’s until the war had finished. He and his wife had been in Dumfries for 32 years and leaving the congregation was a wrench for them both. They moved to Edinburgh where Mr. Ross’s health improved and they were able to come back and visit from time to time. Mr. Ross died on July 6th 1948. The Reverend George Reid Logan was inducted to St. George’s on January 15th 1942 as colleague and successor to Mr. Ross. A welcome social event was held where Mr. Logan was described as ‘a scholar endowed with a fine mind and an excellent German linguist, a friendly man, one who would enter into the difficulties of the congregation with understanding. Mr. Logan became minister at a difficult time with so many men and women away at war, but along with a postal order for 5/- and a booklet published by the Church of Scotland, he took the time to write letters assuring those in the Forces that he was deeply interested in each and every one of them, looking forward to the time when they would be back in the congregation. One of the highlights in Mr. Logan’s ministry came in 1943, marking the centenary of the Disruption. ‘If we omitted to celebrate the occasion of St. George’s hundredth birthday’ he explained, ‘it would be an ingratitude to those who have gone before, the loyalty to principle, the financial sacrifice and the labour of love of our Disruption forefathers.’ A thanksgiving fund was set up, to be used after the war, to make improvements in the church. After the war was over, Mr. Logan warmly welcomed back those who had been away. Indeed, our very own Harold Gibson recalls many a happy evening spent in conversation with Mr. Logan. Welcome Home parties were held, the first being on April 30th 1946, when the minister remembered those who had gone to fight but had not returned. A war memorial tablet was erected in the church vestibule in honour of those who had fallen. Mr. Logan conducted his farewell services at St. George’s on Sunday September 28th 1947 and was inducted to his new charge at Park Church, Helensburgh in October. Some stressed his scholarly attainment, some his gift of preaching, some his pastoral work, others his work among the young. Blessed with all these gifts and more, Mr. Logan left in the knowledge that his ministry had been a source of blessing to many in difficult times. The Reverend Welsh Neilson Peterkin was inducted to the charge of St. George’s Dumfries at a service held in the church on February 28th 1948. At 27 years of age, Mr. Peterkin was the youngest minister to be inducted to St. George’s. Having been educated at Edinburgh University, he was first a student assistant at Broughton Place Church before being ordained as a chaplain in the armed forces in 1945, a position held until demobilisation in 1948.
still a way of life but people were beginning to look ahead to a brighter future. Mr. Peterkin soon made his mark and was just the breath of fresh air that St. George’s needed to take the congregation forward from the dark days of the recent past. Sadly, one of the first milestones in Mr. Peterkin’s ministry was a solemn one as it was to perform a memorial service for the Reverend Duncan Ross who died in July of 1948. Mr. Ross’s ministry was marked by the dedication of a new communion table and chair. This needed a reorganisation of the chancel area and this was supervised by Mr. Alex Wilkie with the help of Mr. Robbie and Mr. Dickson. The total cost of the changes was £2,000, half of which came from the Centenary Fund and half from the sale of Greenbrae Mission Hall. Delays in production meant that it was not until October 1951 that the table and chair were dedicated. The other major change in the fabric of the church was the replacement of the old coal-fired heating boiler with a new electric system. Finance is a subject never far from the forefront of the life of any church, and after much debate, it was decided to introduce the Free Will Offering Scheme, starting in January 1950. The scheme was a great success, with givings almost doubling in the first year. By March 1950, 370 members had joined the scheme. The mid-1950s brought a spirit of evangelism to Scotland, and St. George’s became deeply involved in the ‘Tell Scotland’ movement led by a full-time missionary, the Reverend Tom Allen as well as the ‘Billy Graham All Scotland Crusade’, an event which led to a special train taking people from Dumfries to Glasgow to attend the event! Both of these events led St. George’s to look out to the community, an ethos which is still at the heart of the church today. One significant event which took place in 1954 was the appointment of Mr. Harold Gibson as Church Officer. Incredibly, Harold is still performing this task with as much enthusiasm as he did on his first day. A true servant of the church indeed! Other innovations from Mr. Peterkin’s ministry included a BBC broadcast from the church and a special service for all of the couples he had married during his time in Dumfries. Also, resulting from a time Mr. Peterkin spent in America, was a full-blown Stewardship Campaign, which took the bold move of issuing to the congregation a leaflet suggesting the appropriate level of giving based on annual income. It was in the midst of this campaign that the congregation was stunned by the news that Mr. Peterkin had answered a call to become minister of Broom Parish Church, Newton Mearns. It is perhaps appropriate that Mr. Peterkin’s last act at St. George’s was a special Mother’s Day service, which was broadcast on the BBC Scottish Home Service on March 18th 1958. Mr. Peterkin’s farewell service took place at 3.00 p.m. on the same afternoon. Mr. Peterkin’s successor, the Reverend Arthur William (Willie) Bruce was inducted in September 1958. Mr. Bruce came to St. George’s from Wimbledon Trinity Presbyterian Church of England, having previously served as minister in Camelon and Aberdeen. Mr. Bruce’s ministry in St. George’s can best be described as a time of re-building both in the sense of bricks and mortar and in spirituality. Starting with bricks and mortar, Mr. Bruce arrived at a time when the church was considering the sale of the manse at 14 Catherine Street. In September 1958, the manse was sold for £3,000 and the house known as ‘Darjeeling’ in Edinburgh Road This was £350 over the agreed budget, but as is so often the case in St. George’s, an anonymous donor gifted the money to the church. was bought for £4,850. Discussion on the future of the church halls in Buccleuch Street had been going on for some time and when Moat Brae Nursing Home offered to sell the vacant plot of land opposite the church, the Deacons’ Court set up a special committee consisting of Messrs Hope, Rattray and Wilkie to pursue the matter. The land was purchased for £1,000 and at a meeting of the congregation in January 1960, it was decided that the Buccleuch Street Halls should be put up for sale. These halls were eventually sold to Messrs Penmans for £17,750. Curiously, the new halls were nearly never built as a decision was made to try to buy the Assembly Rooms from the Freemasons for £10,000. This offer was declined and the plans for the new halls were designed and drawn up by Mr. Alex Wilkie and Mr. John Hope. The cost of the new building was £16,000, leaving a surplus of £1,750 which was to be spent on the church itself. Work on the church halls began quickly, with the contract being awarded to Messrs Robison and Davidson. Neither was there any delay in renovating the church and plans to build a new vestry and to reorganise the chancel were soon in place. A new font and lectern were installed, two of the leaded windows were replaced and the organ console was moved nearer to the pulpit. The church reopened on Sunday 4th June 1960, after a period of joint services with Greyfriars Church. The new Church Halls were opened with a service of dedication on Saturday March 4th 1961, with the actual opening ceremony being performed by Mr. Wilson Fell, the member of the Kirk Session having the longest association with the church. The service was attended by over 300 people, including the Reverend Neilson Peterkin and Provost Edward Watt. The following day, the morning service was conducted by the Reverend George Logan, who had been unable to be present at the opening of the halls. The final phase of physical rebuilding took place in 1966, when it was decided to replace the organ with a new Compton electric organ at a cost of £3,900. This meant that the large ‘kist o’ whistles’, the organ pipes which dominated the pulpit area, would have to be removed. Fortunately, Mr. Alex Wilkie had the vision required to fill this gaping void. He redesigned the pulpit area and installed the beautiful silver metal cross which seems to float in the air above the pulpit to this day. The new organ, pulpit and cross were dedicated at a service on Sunday 12th June 1966, with the organ being played by a distinguished son of St. George’s, Mr Derek Johnstone. There was one more building project, although it was not directly linked to the church. Mr. Bruce had always cherished the idea of a Church of Scotland Eventide Home being opened in Dumfries and after much work on his part, Devorgilla House was opened on Thursday September 23rd 1965. Turning to the theme of rebuilding in the spiritual (and financial) sense, Mr. Bruce’s ministry was marked by the Stewardship campaign, ‘Faith in Action’, which ran in 1961. This was not simply a money raising campaign but was a campaign which aimed to make the best use of the many gifts of the members of the congregation. Members were encouraged to use their talents for the good of the church and the congregation and it resulted in a level of commitment which is still a huge feature of the church today. Autumn 1967 brought about the event which Mr Bruce described as being ‘perhaps the most significant of all’ in his ministry. This was the arrival in St. George’s of a Student Mission, consisting of a group of Christian students from the Scottish universities. The mission had four areas of work to perform. Firstly, to visit every home in the congregation. Secondly, to set up a dozen house groups to stimulate discussion and to deepen fellowship amongst the members. Thirdly, to contact and work with teenagers and finally to share in the Sunday services. The impact of the mission was huge and had a great effect on both Mr. Bruce and the congregation and played a large part in shaping the way in which the church operates to this day. Sadly, change often leads to change and at the end of 1968, Mr. Bruce decided to leave to answer a call from the joint Parish of Kilninian and Kilmore with Tobermory on the Isle of Mull. The Reverend Stuart Pryce was inducted to St. George’s on Wednesday, August 27th 1969, arriving with his wife Dorothy and their ten year old twin sons, Robert and Michael. Coming from the North Parish Church Saltcoats, a parish in a new housing scheme, to St. George’s Church Dumfries, situated in the centre of town and with a widespread congregation, Mr. Pryce soon realised that God had called him to a very different ministry. When he came to St. George’s, Mr. Pryce inherited cordial relationships between the former minister Mr. Willie Bruce and Mr. John Melrose, minister of Greyfriars. Both of these men had established a United Watchnight Service held in Greyfriars on Christmas Eve, involving both congregations. Following the retiral of Mr. Melrose in 1972, St. George’s was visited by members of the Presbytery Union and Readjustment Committee with a view to a union with Greyfriars. Although this did not come about, both churches worked closely together in the ensuing years and in 1993, it was recognised that St. George’s could continue as a charge on its own. and a fresh experience of the love of God. Under the influence of the Charismatic Movement, regular meetings for praise, teaching, prayer and ministry began. Prayer has always been a primary mark of the saints of God in every generation of the Church and united prayer and personal prayer were encouraged by Mr. Pryce. With Bible study groups already in existence, members began to meet in each other’s homes, and as house groups developed, more time was given to intercessory prayer, sharing and caring for each other. With the formation of ecumenical prayer groups in the town, members from different churches, including St. George’s, met to pray with each other. Following a ‘Change the World School of Prayer’ seminar in later years, a 10:15am prayer meeting was introduced on a Sunday morning in St. George’s. St. George’s became a founder member of the Dumfries Christian Council in 1977 and Mr. Pryce served as its first Chairman. In the same year, working alongside other Churches of Scotland, a Sunday School was established in the expanding suburb of Georgetown with John Douglas as the first Superintendent and for some time there was talk of building a church there. The 1970s also saw the formation of a Young Wives and Mothers Group by Mrs. Dorothy Pryce; the ordination of the first two lady elders into the Kirk Session; the appointment of David McCullough as organist leading three existing choirs and the joy of celebrating Harold Gibson’s 25th anniversary as Church Officer. In 1974, the former manse at 40 Edinburgh Road was sold and the present manse in Nunholm Park was built at a cost of £19,000. During the 1980s, Festivals of Faith came into being with meetings often being held in our hall. Church of Scotland congregations came together once a month on a Saturday evening to praise Jesus, to share fellowship, to pray with others and to minister to each other. A new awareness of the power of the Holy Spirit grew from those times. St. George’s provided willing leaders and counselors when Dumfries Christian Council organised ‘Mission ’81’ an event held in response to an earlier mission to local senior schools and when Nicky Cruz preached in St. George’s in 1989, counselors were overwhelmed with the number of young people who came forward seeking their Lord and Saviour. The Kirk Session encouraged the life of the congregation and parish visitations were carried out during the 1980s, but the scheme that was to have the greatest effect was ‘Reappraisal for Mission.’ It was time for a radical review of St. George’s in the light of the needs of the day. Changes began to take place in Sunday worship and a Mission Statement was prepared. In the early 1990s, St. George’s hosted many gatherings under the banner of the ‘National Day of Prayer for Revival’, with Mr. Pryce’s encouragement to pray in the Spirit and to tell everyone of the glorious good news of Jesus Christ. It was a great joy for Mr. Pryce as a minister to see someone come to the Lord for the first time and to discover the riches of the Bible. Members of the congregation were encouraged to take part in ‘March for Jesus’ rallies and in 1991, St. George’s was involved in the Billy Graham Live Link from Edinburgh, providing stewards and counsellors. A service of prayers for healing was also introduced. Held once a month on a Wednesday evening over in the hall, this ministry was much appreciated. The more informal Evening Service was also a source of blessing for many, with a sharing of prayers, praise and Bible study. church was redecorated at a cost of £9,050; a gift day was held and the stageroom in the hall set up as a prayer centre; a logo depicting the dove of the Holy Spirit was designed and used on articles of merchandise; a floral display was planted outside Greyfriars Church; a banner was designed; a Noah’s Ark cross stitch was made; hymns were written by members of the congregation; the Kirk Session and Deacons’ Court were photographed; an exhibition of items relating to our church was on display and a book called ‘The Life of Our Church’ was written and published. On Sunday, August 23rd 1993, St. George’s welcomed the Very Reverend Dr. Hugh Wyllie of Hamilton as guest preacher on our special anniversary day. Former ministers Mr. Willie Bruce and Mr. Neilson Peterkin also returned to preach. St. George’s joined with another former Free Church, Maxwelltown West, in an enjoyable ‘Songs of Praise.’ It was also fitting that the final celebration of 1993 should be shared with friends from the congregation of St. Mary’s, the church which Mr. Mackenzie had left in 1843 to form the Free Church of Dumfries. Mr. Pryce retired from St. George’s in 1997 and he and his wife Dorothy settled down in Bridge of Allan. Both had made a valuable contribution to the community of Dumfries through Dorothy being a valued teacher and Mr. Pryce’s involvement as a minister with Devorgilla House, the Technical College, the Royal Infirmary, Gates Rubber Company, and Loreburn Primary School, to name but a few. For a time, he also served as Moderator of the Presbytery of Dumfries and Kirkcudbright and Moderator of the Synod of Dumfries and Galloway. Mr. Pryce served God as minister of St. George’s for nearly 28 years. Forever reliant on the renewing power of the Holy Spirit, the love of God, the living Christ, and the riches of the Bible, his ministry was one of praying, preaching, praising, worshipping, teaching, caring, nurturing, encouraging, healing and love.